360 Newbury is truly an icon, its struts silhouetted against the sky in a high-definition welcome to anyone approaching Boston from the west. Standing sentinel above the Turnpike, it has declared its comfort in being different since the day it was built in 1918. Here, on the edge of Back Bay gentility, its façade clad in lead-coated copper and its street-level canopy cantilevered confidently over Mass Avenue, 360 Newbury remains a remarkable statement of individuality. 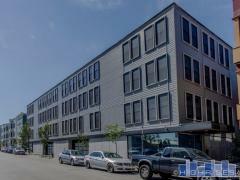 Have any comments or questions about 360 Newbury Lofts? Ask your question and/or share your thoughts about this Building.